WHITESNAKE “1987”: SUPER DELUXE EDITION 4-CD/DVD collection includes the original album with newly remastered sound, unreleased live and studio recordings, classic music videos, concert footage, a 30 minute documentary, featuring a new interview with David Coverdale, Whitesnake’s founder and lead singer. The music comes in a 60-page hardbound book that’s filled with rare and unseen photos from the era, an extended essay based on new interviews with Coverdale, plus a booklet of the album’s lyrics, handwritten by Coverdale. The audio will also be available via digital download and streaming services. The DVD includes music videos for the four singles, all of which have been carefully restored and remixed in 5.1 Surround Sound for the first time ever. 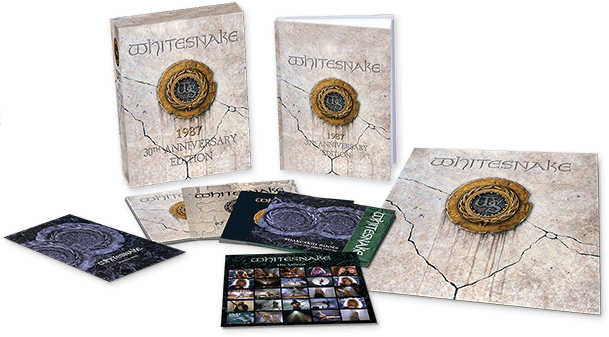 In addition, the DVD also features a new 30 minute documentary about the making of WHITESNAKE “1987”, a new promo video made especially for this set of the 1988 version of “Here I Go Again” and unreleased live footage from the 1987-88 tour.